Jim Shore's hand-carved Heartwood Creek collectibles impart a sense of hope and nostalgia, embracing inspiring themes of family, tradition, spirituality, and patriotism. 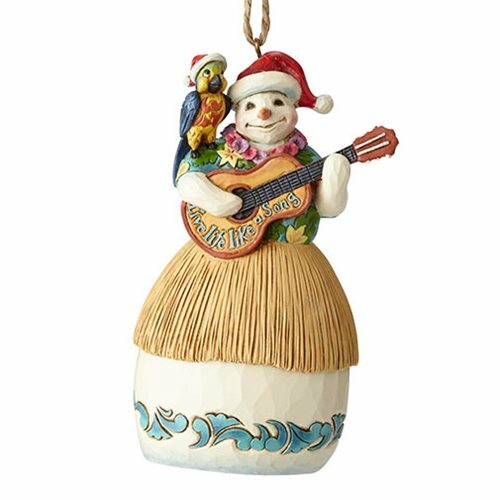 The Margaritaville Snowman with Guitar Heartwood Creek Ornament by Jim Shore will take you straight to the tropics. This cheery snowman is living his life like a song, wearing a hula skirt and lei while strumming his guitar. A festive parrot perches on his shoulder, enhancing the island vibe. Handcrafted and hand-painted, this stone resin ornament brightens the room with its vibrant colors and Jim Shore's signature folk art motifs. The whimsical design is perfect for Buffet fans or anyone who enjoys a sunny day off at the beach. Measures about 4 1/2-inches tall x 2 1/2-inches long x 2 1/5-inches wide.